It’s pretty great being a science fiction fan in general, but it’s especially awesome when you’re directing a multi-million dollar movie and can coax your favorite star into appearing in your film. A luxury clearly afforded to James Gunn. Gunn recently shared an image on Instagram of himself and Ben Browder (Farscape, Stargate SG-1) chilling on the set of Guardians of the Galaxy Vol. 2 in between takes. According to Gunn, they’re talking about one of Gunn’s favorite shows, Farscape. Browder, who played John Crichton on the show, made a cameo in Guardians 2 as Sovereign Admiral. 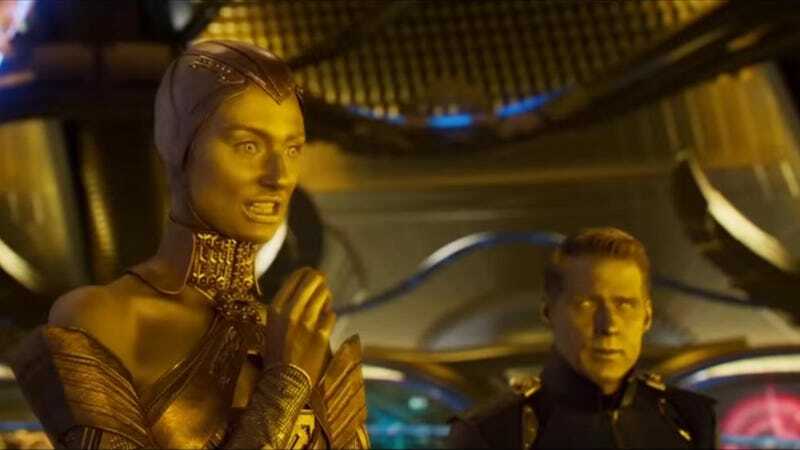 Gunn further explained that Farscape is one of his favorite science fiction shows ever and that’s why he asked Browder to stop by, get painted up in gold, and help Ayesha hunt down the Guardians. One of my favorite scifi shows of all time was Farscape. So when I ran into the show’s star, Ben Browder, a couple of years ago at the Saturn Awards, I asked him if he’d make a cameo in Guardians of the Galaxy. He thankfully agreed and can be seen as the Sovereign Admiral with Ayesha. He’s a great guy. Here we are chatting Farscape. Browder isn’t the only cameo from a beloved science fiction show that Gunn tried to put in Guardians of the Galaxy Vol. 2. Nathan Fillion filmed a cameo that was cut from the final product.